Guaranteed to 12,000 RPM can be used on LI series engines for an Imola Kit or GP 200 series engines for a TS1 kit. 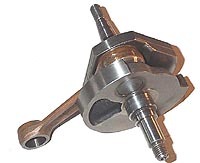 This one shown has the separated bearing type on the crank. Older models have a full bearing both sides. Small taper flywheel fits most 60s flywheels but not P series. Click for more detail.